Crop Factor on Fuji Lenses, Why? It's not the lens, it's the camera. The Fuji cameras have a sensor that produces a 1,5 crop factor - so a 35 mm lens on a Fuji camera produces 52.5 mm view compared the a Full Frame camera without a crop factor. A lens never knows the sensor behind it. A 35mm will always be a 35mm, regardless if there's a Canikon, Hasselblad oder Fuji behind it. Or even a smartphone. What will definitely change is the angle of view. It's much smaller on a small sensor so it seems as if the focal length would be a greater one. So what you really want is the same angle of view on every camera. But no one ever uses this attribute - all we talk about is the focal length. This is why everyone is confused when it comes to the crop factor. I'm with you. I recognize that it is, in fact, a 23mm lens, but to me, it's a 35mm lens and that's what I call it (because I'm old and cut my teeth on 35mm). I have a 24, a 35, an 85, a 135, a 28-85, and a 75-300 on the way (figures rounded for convenience). You are aware that in the long history of photography, the "standard" 35mm film format makes no sense right ? It was mostly marketing that pushed it to be the currently known "standard" format. For a long time it was mostly large and medium format. The 35mm format was considered something silly and utterly small compared to the larger brethren. He pretty much sums it up for a lot of APS-C users. Another point for APS-C, at least for me, focal reducers. Agreed, it adds some softness but getting about a stop worth of light it's just plain great. It's not as if you can't buy digital cameras with full-frame sensors: Nikon and Canon do pretty good ones, if that's what you want. But a bigger sensor means a bigger camera with bigger, heavier lenses. APS-C sensors are smaller, which means smaller, lighter kit - but they're not so small that quality suffers. That's why I'd rather have a 23mm Fuji lens with a crop factor than a 35mm Nikon lens without one, to answer the original poster. Thanks for putting me right there but when I buy a 27mm lens from Fuji I would like it to be a focal length of 27mm. Regardless of the physics, I think Fuji could make that happen. That was a good explanation, thanks for the info. the “ normal or standard”( the lens which gives a field of view closes to the “ normal” image as see from the human beings, is lens is the lens closest to the measure of the diagonal of the format in question. So its focal length varies depending from the format. For the 24 mm x 36mm this is actually 43.3 mm but 50 is easier to calculate, hence, 50mm is the “ standard” focal length for full frame (which refers to the film frame and the sensor which is closest to that size). For aps-C this is 30.1mm. In all honesty I don't really care that a 35mm equivalent lens is called 23mm. When you buy a 27mm lens from Fuji it is the focal length of 27mm, the focal length of a lens does not change based on the camera body or sensor it is placed in front of. The focal length written on the outside of the lens is actually a measurement of the distance between the point of convergence inside the lens and the sensor or film inside your camera. Here is a diagram that illustrates this point. So when Fuji or any other manufacturer labels a lens as 27mm they are telling you what that measurement is, that's all. of course the focal length doesn’t change but, since the sensor is smaller than the full frame which we all knew when we used fil ( even if that isn’t always equivalent to the ancient 24mm X 36mm or 135 or Leica film size...to which all of this still refers too) the images gathered by the smaller area of the sensor appears to be cropped as compared to the image which would have been gathered by a similar focal length on a analog camera with a 24mm x 36mm film. Some things are different though, like the inherent depth of field but they are also different because we have had to deeply revise anything we knew about the “ circle of confusion” on cameras when we switched from film to sensors and then between sensors in size. There is no crop factor on Fujifilm XF lenses, because these lenses have been designed for X-Mount and APS-C. So they are perfectly "full-frame". You'd have to adapt XF lenses to MFT cameras (or smaller) in order to achieve any crop. The new Hasselblad lenses for the new Hasselblad medium format camera are full-frame, too, as they are specifically designed for the 44x33mm sensor inside this camera. However, adapting Hasselblad H series lenses on this camera will result in a crop factor, because the H series covers a larger image circle. So crop factors become relevant in systems that support more than one sensor size (like the mentioned Hasselblads, pretty much all legacy (D)SLR systems, but also Sony's new mirrorless system that features a mount that's used for APS-C and 24x36mm sensors). When you adapt a lens that was made for 24x36 film on APS-C, you only use a cropped portion of the actual image circle, so there is a crop factor to describe that portion and the resulting image impression based on the larger (aka full-frame, uncropped) image circle. That's why we have focal reducers like Speed Booster Ultra or Lens Turbo II, which let us use 24x36mm lenses on APS-C in a way like they would perform on a full-frame camera (and with one stop of additional brightness, hence the Speed Booster name). Referring to "full-frame" as a synonym to 24x36mm cameras is basically a lazy relict of the past, based on the fact that many legacy users only know and used that format. That's why they use it as a reference point for everything, which results in crazy stuff like "crop factors" below 1 for medium format lenses. All this will probably vanish when the current regime of "old farts" will be replaced by the "smartphone generation" who couldn't care less about such relicts. yes that’s true, strictly speaking, but this is all semantics because the angle of view of a 60mm on a aps-c sensor is similar to the one of a 85mm (give or take unless you want to place the dots on every single i ) on a 24mm x 36mm. When we will start speaking of that ( as people do with binoculars) equivalences and crop factors no longer will matter. 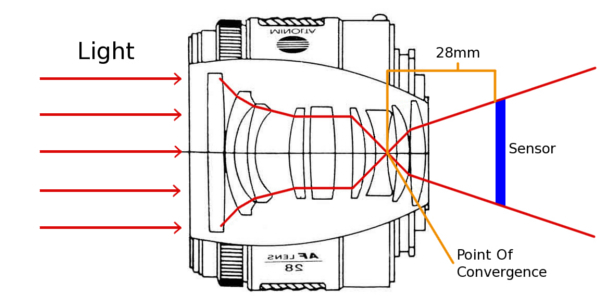 Modern camera makers could simply use angle-of-view and T stop to describe their lenses. That would be state-of-the-art and useful as we could quickly compare lenses across various systems with different sensor sizes, be it 1", APS-C, APS-H, 35mm, 44x33mm or larger. Sadly, most camera makers consider many of their customers old-fashioned and resistant to learning current stuff, so they don't dare to change a thing. Fujifilm, for example, are disqualifying themselves by mentioning the "35mm equivalent" in pretty much every lens description, acknowledging that their core customer base consists of old men who have been socialized with 35mm film and don't know anything else. They also stick to nonsense like "ISO sensitivity", as if the sensitivity of a digital camera sensor would/could ever change. Nobody dares to speak of "ISO amplification", which would be the correct description of what's going on. They probably know that they are principally talking to a public which talks the language of the past. There is little doubt, in my mind, that one of the reasons of success for Fuji was exactly to have catered for a particular niche among consumers which felt alienated by the other brands. Fuji is a comfort camera. It appeals to a part of us which formed itself when cameras were, at least in appearance, like that and didn’t look like futuristic objects which feel alien in one’s hand. This exploitation of a particular market niche is, in my reading... which might not be yours, the dichotomy affecting Fuji at the moment. Should they keep going the traditional look direction and stay a minority brand or should they attempt to gain favor among the younger generations? After all, in 10, 20, 30 years the market base, for generational reasons, will no longer be the same. I am afraid that the traditionalist terminology affecting the marketing of their lenses ( and cameras, as you very acutely point aut about the ISO in digital photography) is one which they perceive as needed to communicate with the majority of their customers. Indeed, and it's also the source of much confusion among such customers. I can observe this not just at my workshops, but also in many mails from users seeking help (which I get on a daily basis). It's weird for a company like Fujifilm to spend so many resources to build the best ISOless APS-C cameras in the known universe, then hide this USP from specs and brochures, where even the advantages of the powerful DR function are mostly ignored. This basically implies that the developers are actually trying to deliver state-of-the-art cameras, but then the marketing department appears to be reluctant to praise them as such. Instead, they sell them like they were some kind of "classic camera simulator" that will emulate a 30 years old analog experience. Like building a modern state-of-the-art flight simulator for an old 737-100. Marketing is not exactly a “ science" (otherwise we would never have any flops among products) but it has its rules and the practice is based on few trials and many errors. It is obvious that, as soon as Fuji introduced the X system, which appealed to a particular market niche, sales shot up where they are now coming from very dissatisfactory figures in the digital photography segment marginal at best for a company which is mostly engaged in other things, like copiers and instant photography ( delivering the vaste majority of their revenue). So it is hardly strange that they “ follow the money”, so to speak. So, I don’t see things changing in the immediate future. However, I am sure that, some time down the line, when the generation of buyers will naturally change, they will change with them or disappear. So when a new generation, who might be made of people speaking using a different terminology will come Fuji will change with them. For the time being this isn’t likely to happen. I guess a start would be to add angle degrees to the novel written on the front of the lenses. Not making a big fuzz about it - just letting it sneak in as luxury information. Yesterday's luxury is today's necessity, so the "feature" might just spread. All brands do what they think is best for them to sell things. If they will feel, one day, that the angle of view can substitute focal length and equivalent focal length, they will do it. I would be rather more afraid than the next generation will look at using a camera in a completely different way than mine or the few among the young people who find it necessary to use a camera. As long as manufacturers get to fudge the abilities of their products by using equivalent focal lengths, f-stops instead of t-stops, inaccurate ISO claims, and whatever else, we'll be stuck with these outdated and less useful terms. Giving more precise, objective statistics would be disastrous to many companies' marketing departments. Why tell people your lens is t/1.6 when you can say it's f/1.2 and charge twice as much? Why tell people your lens is the equivalent of 76-212.8mm f/4.25 when you can get away with saying it's the equivalent of 70-200 f/2.8? Don't expect to start seeing more accurate angle of view and t-stop claims any time soon. Misunderstanding crop factor plays into manufacturers' hands, so they're gonna keep using it. Quoting lenses in "35mm equivalent" is like quoting your new car's gas mileage in "horse equivalent" bushels of grain per furlong. well, although we are using different units for power we are still speaking of HP which, I remind you means, horsepower.